Meet my new Miu Miu white patent bow flats. Aren’t they lovely? The bow is pretty and cute, while the metal buckle reminds one of the Roger Vivier buckle, which gives it a bit of sophistication. The design itself is simple and versatile, making it incredibly easy to wear. Indeed, I’ve been wearing it everywhere. White just looks so good with everything!!! 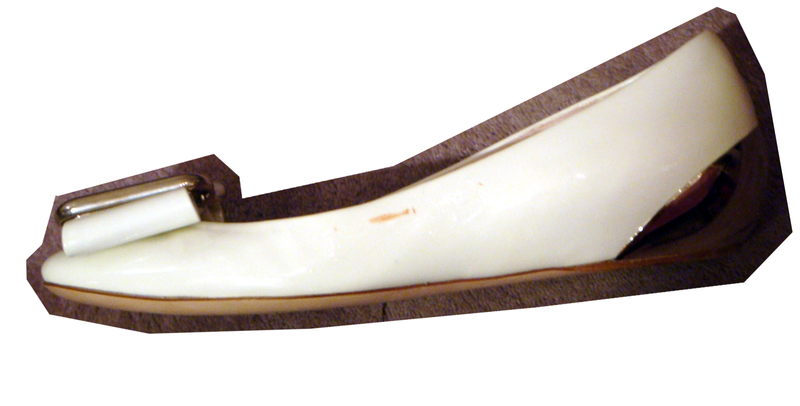 Meet my Miu Miu white patent bow flats one month later. I figured that it’s pretty tough to mess up patent leather…. but somehow somewhere, I have an ugly red/brown scuff on the left shoe on the side facing outwards! I’ve tried rubbing it with water, and by the recommendation of this forum, also tried toothpaste, Vaseline and nail varnish remover. The only thing I haven’t tried is Magic Eraser, and that’s only because I don’t think we sell that in Hong Kong. But NOTHING has worked. Not even nail varnish remover, which everyone has said is a miracle worker. It didn’t even fade a little!!! *tear* I can’t imagine where I could’ve gotten that scuff from. What IS it??? Not even permanent marker is this permanent! Maybe I really do have a tendency to ruin pretty shoes- if not the soles than the sides. I really need to go to walking school. Anymore ideas on what I can try to save my flats?????? why not trying to hide it ??? try use the same nail colour to hide it maybe ? rubbing alcohol? Or maybe you should take it to those shoe repair places in HK. I think they still exist. I am sure you can get a contact to send you a Magic Eraser. It truly works on everything. Good luck. In an desperate attempt I would probably try some diluted CLR. Hi. I started off following your old group blog and have now moved on to this newish one…love it. I’ve nominated you for a blogging award which you can find out more about on my blog later today. Thanks for sharing your fashion thoughts! Someone told me a long time ago about using a golf ball to rub the scuff out. I never took the time to try this since I have never then nor now owned a golf ball. But hey it’s worth the try, especially for such fabulous shoes as those.